I apologize for the non-artistic photo above. I had someone else take the photo for me. You’ll soon know why I didn’t take the photo myself. Where to start? I guess I should jump right in and state it. I BOUGHT SOME ADULT DIAPERS. THEY WEREN’T FOR ME AND IT WAS AN ACCIDENT. Don’t laugh at the “accident” statement. This isn’t funny nor will it ever be. Not even if I get to my golden years and actually have to wear them. If you‘ve read my previous blogs, it’s obvious the aneurysm fairy will get me well before my golden years do. Here’s how it went down. On the celestial level, some random stars and black holes aligned. The ionic pull from this event caused the moon to writhe in pain from a gravitational spasm. This gravitational charley horse made its way to earth. Thus knocking my box of perfectly baked Cheese Nips to the floor. The entire box, all 212 perfectly baked Nips lay at my feet as the “5 second rule” took affect. I froze in horror. Gravity had never been this violent to me before. Not even when I jumped off the garage roof in my parachute pants. Despite the shock of the event and having just cleaned up the 212 Nips, I was still in the mood.. (Yes I counted them. It’s so rare to find a box of un-burnt Cheese Nips that I took note). So off to the grocery store I went. Got there, grabbed a new box of Cheese Nips. Since I hate only buying a single item I remembered I should get some toilet paper. I Got the toilet paper and realized this Cheese Nip, toilet paper combination looked kinda stupid. So I also bought a pack of double A batteries and a small potted plant. I always try and buy completely random and separate items. I do this because, one time I went to Sam’s Club and bought a chain saw and a large sausage. The cashier, thinking she was funny, said “wouldn’t a knife be easier?” It wasn’t funny. So now I try to avoid awkward check-out episodes. Anyway my shopping was now done. I made my way to the check-out lines. Unfortunately there was only one register open and it was experiencing a rush of people. What made things worse, it was being run by a girl named Trainee. As I stood watching her TRY and ring up people, my heart went out to her. People were getting really agitated and taking it out on her. The manager was getting red-faced. Because on nearly every transaction he had to come out of his office with the key to void a transaction on her register. After nearly 15 minutes of waiting, it was now my turn. So I strolled up to the counter, placed my four items neatly together and said to Trainee “Aren’t you glad you have only 10 minutes until closing time?” Without looking up, she said “It’s been like this all day.” There, we bonded, I thought. Just then, that celestial domino affect kicked in again. My keys violently dropped from my pocket to the floor. So as I bent down to grab them Trainee began scanning the items. As I grabbed the keys and made my slow ascent upwards I heard the beep!….. Beep! … then in rapid succession beep! beep! beep! Five beeps? I straightened just in time to see her scanning an enormous package of Depend Undergarments. “Those aren’t mine.” I calmly stated. Laughingly I finished with “Don’t need those, my bladder is good to go.” Witty and charming, that’s me. At that moment she freaked out a little bit. 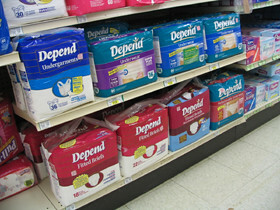 Apparently the Depends were supposed to be re-shelved. Along with a lot of other items inhabiting the counter. She informed me she would have to get the manager to void the transaction. Ok, no big deal. Get the manager, void the transaction. Before I knew it, I’d be sitting on the couch with a fresh box of Cheese Nips watching reruns of Designing Women. Here’s where the story gets real bad. She pleaded with me to just pay for my items, as well as the Depends. She said the manager was already extremely mad at her. Requesting he come out with the void key would probably get her fired. But I didn’t want the Depends! She said just come back tomorrow with the Depends and the receipt, then I‘ll get a full refund. I felt bad for her. Fine, that’s what I was going to do. So I requested she put the Depends in the biggest bag they had. She, in her first moment of retail competency, motioned to the plastic handles on the Depends. They didn’t have bags big enough. “Oh Crap!! !” (still not funny) Good thing I parked close to the building. So I began my way to the exit. I also noticed it was getting a bit dark. The cover of darkness is always a good thing. I was beginning to feel home free. However, just as I turned the blind corner to the exit, the automatic IN door swung open. Thus knocking the enormous bag of Depends out of my hands toward the opposite set of IN OUT doors. I froze, arm outstretched. At that same moment the adult diapers were in flight the local college’s girls’ soccer team were streaming in both entrances. I suppose to buy some after game snacks. Before the diapers hit the floor, one team member had already instinctively Pele bicycle kicked the Depends to another team member. Who then “headed” it to my stunned outstretched hand. It spun on my wrist four times before coming to a stop. At that moment I realized I had just been introduced to the aneurysm fairy.